Not so long ago it was popular to mock U.S. manufacturing. After all, global manufacturing competitiveness increased greatly as newcomers China, India, and Brazil made a big splash, while in the U.S. danger signs were difficult to ignore. Even as American high-tech manufacturers continued to lead the world in total output, their global share fell from 34 percent in 1998 to 28 percent in 2010. Over that period, the U.S. share of global high-tech exports declined from 22 percent to about 15 percent, according to government statistics. But the days when manufacturers in other countries hold an advantage over competitors in the U.S. may be coming to an end. In large measure, this is due to a serious commitment by public and private sectors working together to change the trend and with it, they hope, also the public’s perception of American manufacturing, once a source of national pride and optimism. Americans believe that a high-performing manufacturing sector is imperative if the United States is to prosper in the 21st century. A survey by Deloitte Development LLC and The Manufacturing Institute shows that 85 percent of Americans said manufacturing is important to the country’s standard of living and 77 percent said it is very important to national security. Consistent with this view, 79 percent said that a strong manufacturing base should be a national priority. 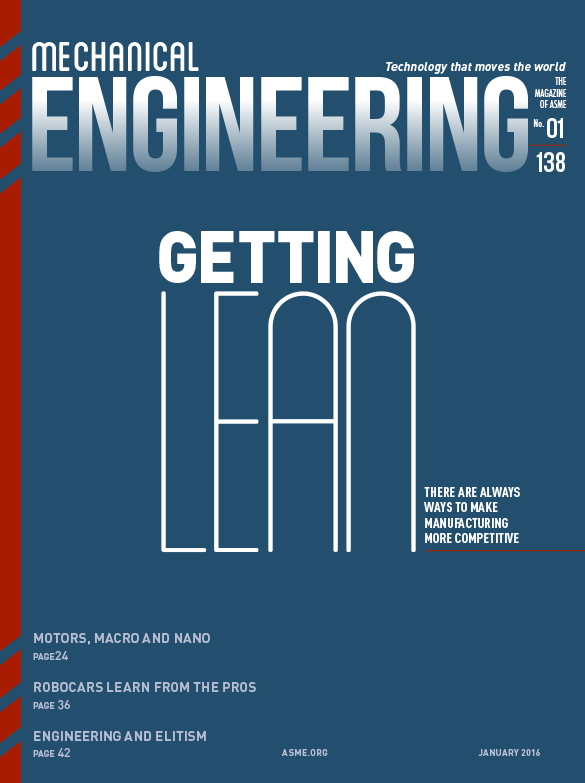 The drive to restore American leadership in manufacturing innovation is spurred by engineering and scientific advances that have given birth to cutting-edge materials and new processes. This technology has revolutionized ways to manufacture existing and new products in ways never before possible. The term advanced manufacturing points to innovation that is occurring in the manufacturing ecosystem, including the digitization of equipment and processes, 3-D printing, and new materials with custom-designed properties. ASME’s Industry Advisory Board and other representatives from ASME met recently at the Digital Manufacturing and Design Innovation Institute (DMDII) in Chicago—one of seven institutes developed under the National Network for Manufacturing Innovation—to begin a conversation on the role ASME might play in helping to support the growth of advanced manufacturing. The six other institutes focus on additive manufacturing, lightweight metals, semiconductors, composites, photonics, and flexible hybrid electronics. These institutes represent a government initiative linking industry, academia, and government partners to nurture manufacturing innovation and accelerate commercialization. Located throughout the United States, they bring together small manufacturers that could not otherwise afford to invest in advanced manufacturing research and expose them to cutting-edge technology. The Department of Defense supports the institutes because it views their areas of research as core competencies essential for the future of national security, said Adele Ratcliff, the director of manufacturing technology in the Office of the Deputy Assistant Secretary of Defense for Manufacturing and Industry Base Policy. But there’s yet another benefit. Government focus on national manufacturing will bring back enthusiasm for science, technology, engineering, and math education, argues Ratcliff. “There’s a relationship between low STEM scores and manufacturing offshoring.” As pride is restored in this country’s manufacturing backbone, she said, scores will go up as more kids will want to be part of the revolution. Viva la revolución! Companies are recognizing that with the use of the refined metrics of total cost of ownership to uncover the hidden costs and risks of offshoring and reducing costs with sustainable strategies such as robotics, improved product design and automation they can increase competitiveness and manufacture profitably in the U.S.
We see many companies moving toward localization. U.S. companies are reshoring and foreign companies are investing in U.S. locations to be in close proximity to the U.S. market. Reshoring is a good strategic move for many companies due to rising offshore wages, counterfeit parts, IP risks and quality issues. By reshoring and shortening supply chains, companies can improve lead times, responsiveness to customers, quality, innovation and R&D. The U.S. has suffered for decades with a huge trade deficit that now is about 4X the world’s next largest. Let’s convert this liability into an asset. The winning strategy is balancing the trade deficit with a strong investment in automation and skills training and increased corporate use of Total Cost for sourcing and plant siting decisions. A competitive USD and corporate tax rates would accelerate the process.